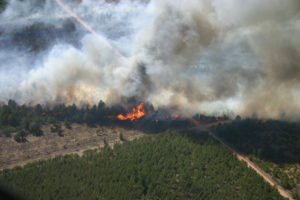 While spring is always much-welcomed after Wisconsin’s long winters, seasonal warm and dry conditions can result in increased wildfire activity. 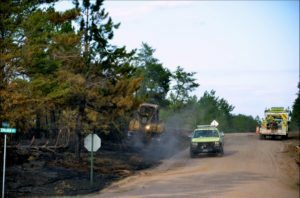 Northwest Wisconsin is taking a moment to highlight and remember the efforts that went into battling the historic Germann Road Fire as well as the recovery efforts still going on today by hosting an open forum on May 12, 2018. There will be a brief presentation about the fire, as well as what the burnt area looks like today as the community and landscape continues to recover. 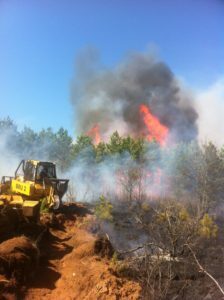 On May 14, 2013, logging equipment sparked the Germann Road Fire in Douglas County that resulted in 7,499 acres burned and numerous structures lost before crossing into Bayfield County. Light rain moved through the area that morning dampening only the fine surface vegetation for a fleeting period. When the sun broke through the clouds, the landscape rapidly dried out becoming a prime receptor for a spark. At 2:45 pm, Brule DNR dispatch started a response that would last the next two days. The fire threatened approximately 450 structures and destroyed 104, including 23 primary residences before being declared contained on May 15. One-hundred sixty-seven Wisconsin DNR personnel with 32 tractor plows, 5 heavy bulldozers and 100 fire engines worked feverishly to contain the fire, while 44 fire departments protected structures threatened by fire. This was the largest use of aircraft for fire suppression purposes on a fire in Wisconsin’s history. Thirteen aircraft including both fixed-wing and helicopters supported the efforts of ground crews. In the years following, many of the homes and buildings have been rebuilt, yet some remain as a constant reminder of the fire-prone environment in northwest Wisconsin. Vast expanses of burnt forest have been opened giving way to new life on the landscape. In areas where tall pines once stood young seedlings are taking hold and reclaiming the ashes. 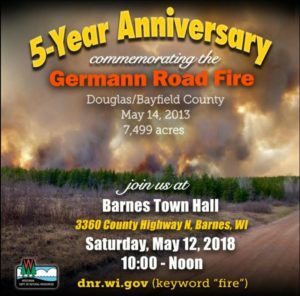 Please join the Wisconsin Department of Natural Resources staff and other first responders at the Barnes Town Hall on Saturday, May 12, 2018 from 10:00 am until noon to learn more about the Germann Road Fire and the recovery that continues today. Barnes Town Hall is located at 3360 County Highway N, Barnes, WI 54873.